Looking for a unique way to get the kids involved in preparing your holiday table? What about a Scottish Dinner? 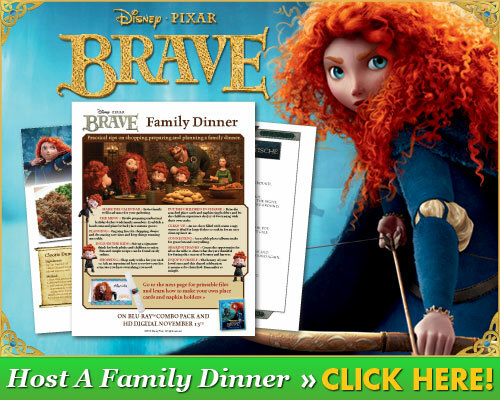 Disney/Pixar is sharing a myriad of ways to bring Scotland to your holidays with BRAVE inspired tips. Instructions on how to host and plan a family dinner with printable name cards, napkin holders and authentic Scottish recipes will have you dancing with joy! And why not make it a Scottish jig? You’re nothing if not committed to a theme. Don’t know how? The below printables also include a step by step guide on how to dance the Highland Scottische that will have everyone leaping to their feet for a twirl around the dance floor, exactly what’s needed after an indulgent meal! Download Games of Bravery from the Movie Brave! Disney/Pixar’s BRAVE: Hidden Movie Gems…Can You Spot It? See Disney’s “BRAVE” Newest Trailer! I wonder if they have a recipe for haggis. I checked it out-these will be fun recipes to try! I have yet to see this movie, but I love food. So great site! So fun – I like to build whole days around a theme! THis food sounds fabulous. I haven’t seen the movie but this is a great way to make an EVENT out of it.